What was your favorite children’s book as a child? Do you still remember Pinang who turned into a strange yellow fruit with a hundred eyes? What about the fight between the turtle and the monkey? Do you remember whom you rooted for? The month of July is dedicated to the promotion and development of children’s books. Every year on the third week of this month, National Children’s Book Day is celebrated. It is also a day in which we commemorate the anniversary of the publication of Dr. Jose Rizal’s The Monkey and the Turtle in Trubner’s Oriental Record in London. This whole-day summit will hold discussions on trends in the Asian children’s book industry, children’s literature, best practices in copyright, and Filipino comics. It will feature local and international speakers who are committed to this significant and thriving aspect of the book publishing industry. One of our guest speakers is the winner of the Illustrator’s Award at the 2015 Sharjah Children’s Reading Festival, Wen Dee Tan. Lili, one of her picture books, won third place in the Macmillan Prize 2013, an annual picture book competition by Macmillan Children's Books UK. Joining Wen Dee Tan is Mariko Nagai, an Associate Professor of creative writing and Japanese literature at Temple University, Japan Campus in Tokyo. Mariko has received the Pushcart Prizes both in poetry and fiction. Nagai's collection of poems, Histories of Bodies, won the Benjamin Saltman Prize from Red Hen Press, and her first collection of stories, Georgic: Stories won the 2009 G.S. Sharat Chandra Fiction Prize from BkMk Press. Her other books include Instructions for the Living, and Dust of Eden. 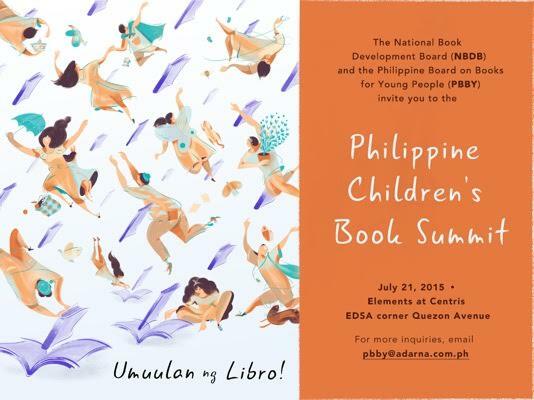 Local authors and publishers who will be sharing their knowledge on children’s content are MJ Tumamac, author of Ngumiti si Andoy; poet and fictionist Kristian Cordero; Edgar Samar, author of the Janus Silang series; Blooey Singson, owner and writer of the blog “Bookmarked! ;” Carljoe Javier, managing editor of Anino comics; and children’s book author Cheeno Sayuno; among many others. The festival will also feature a performance by a children’s choir, a book fair, and the awarding of the PBBY Alcala and Salanga Prize winners. The summit is open to authors, illustrators, publishers, educators, and librarians who are devoted to ensuring quality books for children. Every year the PBBY gives recognition and awards to children’s book illustrators and authors with works published in 2014. The PBBY Salanga Writer’s prize is given to authors who have crafted a tale worth telling to children and adults alike. This year, Cheeno Marlo Del Mundo Sayuno, an instructor at the University of the Philippines Los Baños, is the lone honorable mention winner for the PBBY Salanga Writer’s prize. His winning story is entitled, The Missing Blanket. The PBBY awards Joffrey Z. Atienza and Maria Sabrina P. Palmares as Honorable mention winners for the 2015 PBBY Alcala Illustrator’s prize. No one was declared Grand Prize winner for the award this year. As in previous years, winners of the PBBY Alcala Illustrator’s prize are chosen based on their creative approach to the winning work for the PBBY Salanga Writer’s prize. The awarding ceremony will culminate the Philippine Children’s Book Summit on July 21, 2015.